Seriously, I did look forward to listen to Codex with impatience, and now, after five or six listens, I am still thrilled, each time when these droning soundscapes penetrate my eardrums. 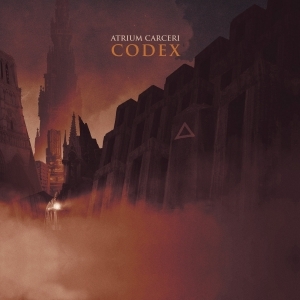 I will skip an extended introduction of Atrium Carceri; you can check out any other review I did in the past for this outfit or the label to find out some more background information. I’ll go to the content of this album immediately. It took Simon three years to finalise Codex, and like always, everything was created by the master himself: song writing, recording, production, mastering and the artwork. The compact disc edition comes in a hard cover digipack, actually as digi-book, with a 16-paged accompaniment / supplement, containing artwork on which Simon has been working for years as well. ‘Deep in the roots of the citadel a sea of white robes ever flows. Those fallen from Elysium kneel here, with blissful smiles and fearful eyes. Codex starts with The Void, for which a video has been made too, by the way. It shows the excellence of this project’s constantly progressing evolution. The Void is, in a sense, dynamic and rich, with so many layers, permanently revealing new aspects which are hidden behind closed portals. The atmosphere is extremely suffocating and oppressive, painting an atrocious and desolate landscape after a disastrous catastrophe. This kind of Aural Art is often called ‘cinematic’, but this must be a soundtrack for a film noir, a motion picture of ominous grandeur. It’s fantastic to undergo the strong yet darkening progression, step by step marching on with increasing synths and industrialised pounding beats. From Chasm Reborn, the second composition, initially reminds me of the more Lovecraftian oriented outfits on this label because of its disarranging sounds. Spooky soundwaves, horrific noises and sorrowful piano are interacting the whole of the time, which is a huge contrast to the sombre and Arctic-cold glooms of The Seer. Compositions like Sacrifice To The Machine (fantastic, with those floating synth lines and brooding beats), The Ancient City or The Citadel (the lengthiest composition, which has so much to offer!) uncover the multi facets and richness of sound manipulations, mesmerising melodies and creepy industrialised injections, organically collected and reconstructed into fabulous sonic experiences. It’s haunting and asphyxiating, but at the same time so attractive, beautiful, inspiring and spiritual. Utter melancholy, emptiness, soberness gets represented via (shorter) piano pieces (not exactly intermezzos, for these tracks are not just a ‘glue’ in between other pieces, yet equipollent chapters in the whole sonic voyage), such as A Memory Lost or A Hunger Too Deep.